Just like fashion, food, and music, travel destinations follow clear trends. One year, all of your friends are flying to Iceland for the weekend. The next, Disney Springs is the place to be in Florida. And every January you see those trends repeated in “Where to Go This Year” listicles across the internet (shortly followed by a flood of pics on your Instagram feed). As travel editors, it would be easy for us to follow suit and recommend only trending destinations. But we decided to take a step beyond your classic list and analyze why a vacation is great for distinct types of travelers. Are you a beer nerd who could spend a week discussing hops? Atlanta stood out for its 20+ breweries — five of which earned top honors in our Editors’ Choice Awards. Are you an avid plant mom, who loves to explore the city but needs some greenery in her life? Go to Portland, Oregon, which houses a 5100-acre forest reserve with more than 70 miles of trails. Do you just want to sit on a beach all day? Hawaii is the old-school choice that’s suddenly cool (and affordable) again. You’ll see destinations both familiar (Chicago) and perhaps unexpected (Rapid City, South Dakota) on TripSavvy’s list of Where to Go in 2019. But trust that each destination was selected to make your vacation — not your Instagram account — incredible. 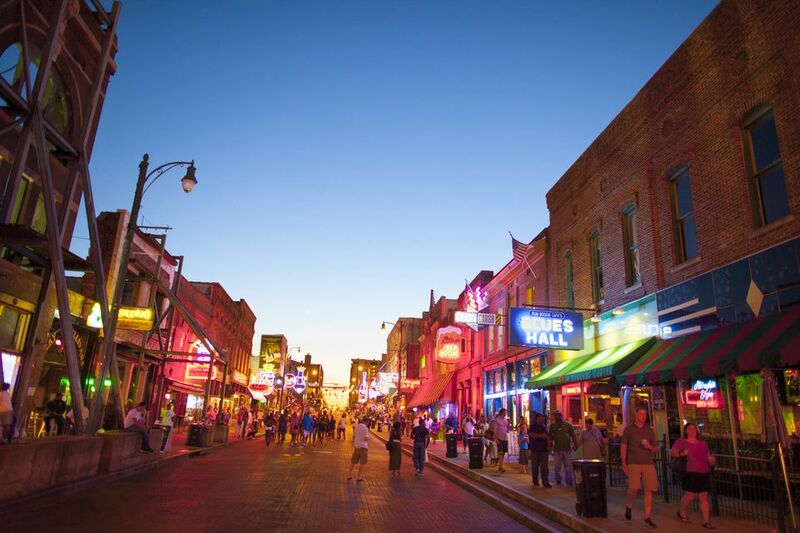 Downtown Memphis is dotted with new, must-see sites. The Hu Hotel has opened on the site of the former Madison Hotel. In its enclosed rooftop, you can watch the city’s brand new light show, Mighty Lights, that airs every hour on the Hernando de Soto Bridge (and Big River Crossing). Down the street you can visit Old Dominick, the city’s only whiskey distillery. It serves a hot toddy Memphis doctors used in previous centuries for medicinal purposes. Nature lovers will cherish the bike paths that now connect all parts of the city. You can ride over the Mississippi Bridge or in forests with rare animals like blue herons. Rapid City, South Dakota has long been the state's best starting point for those looking to explore the Black Hills, Badlands National Park, Custer State Park (where the buffalo roam!) and the Pine Ridge Reservation. And it's a momentous year for many of these attractions: Custer State Park is turning 100, as is the Black Hills Roundup Rodeo, and Badlands National Park is celebrating its 80th anniversary. But between outdoor adventures, save some time to walk Rapid City's streets. This year, the "City of Presidents" exhibit (there's a different life-size president statue on most of the city's downtown street corners) will unveil Barack Obama's statue, created by local artist James Van Nuys. Founded in 1718 by Spanish explorers, San Antonio is a modern city with a long and fascinating history. The Alamo is best known as the site of a key battle for Texas independence, but it is also part of a group of five missions built in the 1700s by Spanish missionaries. In 2015, the missions were deemed to be so historically significant that they were collectively named a UNESCO World Heritage Site. As the 2020 Tokyo Olympics approach, major industrial developments are changing the landscape of the metropolitan area. 2019 offers the perfect opportunity to explore the city before the crowds descend for that global event. The Shibuya Stream project kicks off in July 2019, which seeks to connect the posh shopping district of Daikanyama with Shibuya via a previously underground waterway. The transformation also promises a new and improved Hachiko Square as well as expanded pedestrian walkways. Whether you worship science, Spielberg, or superheroes, LA is the top spot to let your geek flag fly in 2019. Nerd out with (inter)stellar lectures and tours at the Jet Propulsion Laboratory, Griffith Observatory and the space shuttle Endeavour exhibit at California Science Center. See the other kind of stars in new ways too. Along with the 30,000 square-foot show dedicated to moviemaking, the Academy Museum will kick off with the first major U.S. exhibition about beloved animated filmmaker Hayao Miyazaki and Studio Ghibli. Cinephiles should also hit the Warner Bros. Studio Tour, which recently introduced elaborate exhibits on the DC Comics universe and Harry Potter complete with Aquaman costumes and a working Sorting Hat. June of 2019 brings the galaxy far, far away to Disneyland when a Star Wars-themed land and Millennium Falcon ride open. For more Jedi hijinks, line up with mega-fans for ten days in December to catch the first screening of the Skywalker saga finale at the TCL Chinese Theatre or sip droid-approved drinks (and Marvel margaritas) at the pop-up gone permanent Scum & Villainy Cantina, where king of the dorks Kevin Smith records his podcast. With its mix of old and new, classy and cool, wild and chill, London has what every type of partygoer needs for a good time in 2019. The city's nightlife is a mix of old and new, sparkling and cozy, wild and chilled that will fulfill any party mood. Legendary establishments are still going strong. At Claridge’s Bar celebrities guzzle champagne and dance on tables. Members’ club Annabel’s, the only private establishment frequented by Queen Elizabeth II, just moved into a modern townhouse to serve its next generation. Craft beer is hopping in Atlanta. The city is home to nearly 20 breweries, five of which made the cut in TripSavvy's Editor's Choice 2018 awards. Founded in 1993, Atlanta Brewing Company (formerly Red Brick Brewing) is Georgia's oldest brewery and offers nearly 20 beers on tap, including the Hartsfield IPA named for Atlanta's bustling airport. Denver might have a reputation as one of the most active cities in the country (outdoor recreation is practically built into the local lifestyle), but it’s also becoming a hotspot for just the opposite kind of leisure activity: relaxed and boozy weekend brunches. Proof of the meal's popularity in Denver is found at any of the Snooze A.M. Eatery locations on weekend mornings when people wait in line for up to a couple of hours for a coveted table (and an order of the popular pancake flights) inside. People from all corners of the Mile High City are making the trip downtown — according to the 2018 Lyftie Awards (Lyft’s annual list of the most popular destination for ride-sharers), Snooze was the most popular destination for brunch seekers in Denver. Other long-time local favorites include Sassafras for its Southern comfort food, Jelly, a retro-style spot with traditional American breakfast food, and Denver Biscuit Company for, of course, its biscuits and massive biscuit sandwiches. There’s plenty to do in Miami when it comes to watersports and nightlife, but first, there’s coffee. The city, known specifically for it’s cafe con leche — like a latte, but with a ton of sugar — is getting into third-wave coffee now, so in addition to the traditional Cuban brew, there are specialty shops popping up around town that are just as aesthetically pleasing as they are delicious, energizing and, most importantly, high quality. Bring a book or a friend; chances are, you’ll probably stay a while. Deco Coffee Co. in Allapattah is an art deco-style restaurant and roastery brought to you by the Relentless Roasters (and Threefold Cafe) team. A tiny pastel pink shop with plant-based milk options and artisanal goods for sale, Galleria is a place where West Coasters and Instagrammers will feel right at home. Then there’s All Day, a great space for caffeine and/or cocktails with an outdoor coffee window. Perfect quick stop when you’ve got your four-legged friend in tow. Stalwarts Pujol, Quintonil and Contramar are already on your list. But in 2019, Mexico City's fine dining scene is anything by stagnant. Chef Eduardo Garcia (of Maximo Bistrot fame) recently opened Havre 77, a chic and intimate spot for French classics in charming Colonia Juarez. Further south, Sud 777 — the number 11 restaurant in Latin America according to World's 50 Best — receives a makeover from local design firm La Metropolitana, known best for furnishing Noma's Mexico pop-up in Tulum back in 2017. And much to the delight of the local community, hotspot Masala y Maiz has finally reopened a brick and mortar after being shuttered while refusing to pay a bribe. There's a place in the dessert world for homey, nostalgic sweets: boulder-sized chocolate chip cookies at Levain, classic pies at Two Little Red Hens, even cookie dough — raw cookie dough — at DŌ. But this year, we're feeling a little more sophisticated. Sometimes that means the boundary pushing, like the off-the-wall, Insta-friendly croissants at Supermoon Bakehouse (cream cheese-mandarin-black pepper, anyone?). OddFellows and Morgenstern’s have opened new outlets in Nolita and the Village, respectively — spreading the gospel of innovative ice cream (from Morganstern's banana-kalamansi to OddFellows' Malt Maitake Peanut) ever-further. Berlin’s known for being an inexpensive city to travel to — and for good reason: The city is full of free things to do, whether you head to Tiergarten (Berlin’s answer to Central Park) for some sun, take in street art at the East Side Gallery — which uses the longest remaining stretch of the Berlin Wall as its canvas — or decide to stroll the runways of Tempelhof Field, a decommissioned airport that’s been left largely intact and turned into a park for Berliners. Plenty of museums, like Urban Nation (a street art museum that’s just a few years old), also offer free admission. Other free days for culture vultures? Hamburger Bahnhof, one of the city’s best art venues, recently started free Thursdays from 4 to 8 p.m. Design-lovers should head to the Bröhan Museum, which is free on the first Wednesday of the month.